In 1989, a New York wine merchant was asked to sell an extremely rare and sought after wine on consignment. The asking price? $519,750! 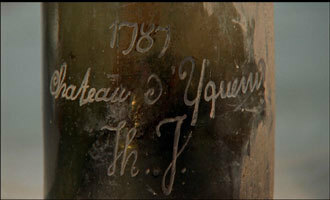 The wine, a 1787 Chateau Margaux, a bottling which would be in demand by collectors in any circumstance, had additional value due to a set of initials engraved in the glass. The letters “Th. J.” were believed to represent the first and last name of Thomas Jefferson, third president of the United States and an avid wine collector (while serving as the first Secretary of State, Jefferson placed orders for French wines for both himself and George Washington). In 1985 another Thomas Jefferson wine had gone for $155,453 dollars at auction. The wine merchant, William Sokolin, known for his showmanship and promotional abilities, had originally set the price of the 1787 Chateau Margaux at $250,000. After attending an auction where, in Sokolin’s words, “a footstool that looked like it would fall apart” sold for $290,000 the price was raised over the $500,000 mark (gaining large amounts of publicity in the process). When Sokolin was invited to attend a black tie dinner celebrating the latest release of Bordeaux wines he knew the attendees would be a who’s who of New York’s wine elite and a prime marketing opportunity. At the dinner, with the 200 year old bottle in hand, Mr. Sokolin made his rounds displaying the prized wine to a number of admirers. Spotting a friend on the far side of the room, Sokolin strode across the floor. While en route Sokolin accidentally struck the bottle against a metal topped serving table. To his horror, two holes appeared in the ancient glass and the dark red wine drained on to the floor, leading People magazine to note that Sokolin had created “the world’s most expensive puddle”. The only good news was the bottle was insured and the policy later paid out $200,000. With this cautionary tale in mind we encourage you to minimize the chances of breaking a wine bottle by pouring its contents into glasses as soon as possible!